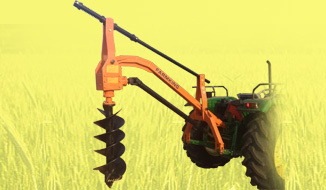 The post hole digger is basically tractor drawn implement mounted on the 3 linkage of the tractor. It is driven by tractor P.T.O. 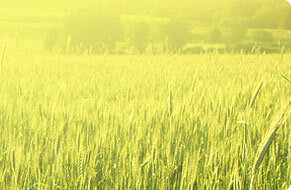 ; it helps for digging holes for plantation, polo standing, etc. 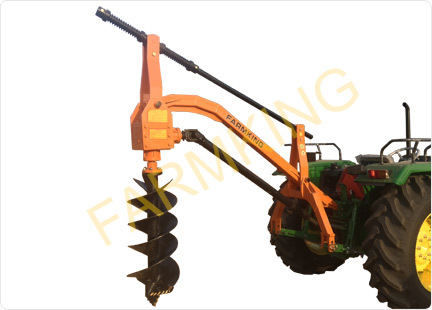 FARMKING Post Hole Digger is tractor PTO driven implement to drill holes 12", 18", 24" and 36" width hole for plantation & commercial purposes. The maximum depth, which can be obtained of 3 Ft. to 9 Ft. tractor mounted and hydraulic. 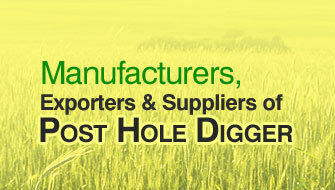 Hole Digger is equipment, which can drill / dig holes of various sizes and depths in soil. Hole Digger is used to make pits for plantation of mango, coconut, teak, pomegranate, lemon, phyllanthus embolic & sugarcane etc. Tractor PTO of 540 RPM mechanically drives Hole Digger Augur. Hole Digger consists of a stabilizer system, which keeps the augur perpendicular to the ground while in operation and controls swinging of augur while moving from one point to another point. Hole Digger Gearbox, Power Transmission, Shaft and spirals are most important. Special steel grade cast cutting tip with semi-double flighting. It has heavy duty gear box with output shaft with shear pin protection. 1. Hole Digger suitable for 18 HP to 75 HP, with 540 PTO RPM 12", 18", 24", 36", hole Dia. Augurs. 2. Hole Digger suitable for 50 Hp to 75 Hp, with 540 PTO RPM 18", 24", inch augur with 3Ft. to 9Ft. depth for commercial purpose.